Lava flows can travel long distances if they develop insulating conduits for transporting fresh molten lava to the flowfront. These conduits are, of course, called lava tubes. The longest tube-fed flows on the island are 1) the `Ai-La`au pahoehoe flow that erupted from the Kilauea summit area and entered the ocean 24 miles away at Kaloli Point in the Paradise Park subdivision and 2) the Mauna Loa 1859 flow which erupted at the 11,000 foot level and entered Kiholo Bay 32 miles away. If efficient tubes had not developed, the lavas from these eruptions would have stacked up near the vent. Thurston Lava Tube showing the beginning of stalactites. Lava tubes form in two main ways. Near eruptive vents, lava flows are commonly fed by channels. With time, the channel edges can build upwards and arch over the stream eventually forming a roof and becoming a lava tube. Away from the vent, tubes usually evolve from the molten interior of pahoehoe flows. Cooling of the flow from the sides and top form strong walls containing increasing amounts of flowing lava. The cooling walls continue to constrict the flowing stream until either the roof is pushed up, forming the abundant cleft hills, called tumuli, that we see almost everywhere on pahoehoe lava flows, or the floor of the tube is melted allowing the lava stream to bore downward. We have measured this downward melting rate to be up to 4 inches per day. The lava tubes that are now carrying lava from Pu`u `O`o 8 miles to the ocean are typically 10-15 feet in diameter and 5-20 feet beneath the surface. The tubes are generally wider and deeper near the vent and smaller and shallower near the coast. The lava flowing through the tube is rarely more than 5 or 6 feet deep flowing at speeds of less than two miles per hour. The fastest lava stream measured during the current eruption of Kilauea was travelling at a speed of nearly 16 miles per hour. 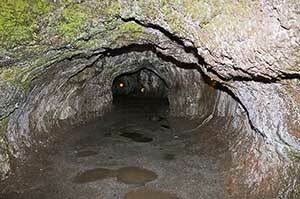 Once a lava tube is established, all later lava flows start as breakouts from the tube. These may be due to blockages in the tube which force the lava stream out to the surface at a weak point upstream of the blockage. Sometimes the lava tube blockage can be cleared and flow resumes down the tube. If this occurs, the breakout is robbed of its lava supply and it dies. If the tube is not cleared, then the breakout ends up transporting all the lava formerly carried by the lava tube and it begins to form its own, new tube. 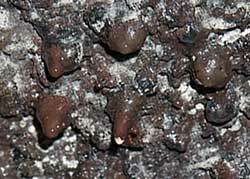 The careful study of old, cooled lava tubes provides crucial detail on the way lava streams shape tube interiors and form several, unusual features unique to lava tubes. Both Nahuku (the lava tube formerly known as Thurston) in Hawaii Volcanoes National Park and Kaumana lava tube along the Kaumana Drive in Hilo are open to the public and contain a variety of lava stream features. The Kaumana tube fed the 1881 flow from Mauna Loa which actually flowed into Hilo along the upper half of Mohouli Street before the street was built. Witnesses estimated that the lava stream flowing through the Kaumana tube was travelling at a speed of 40 miles per hour. In both tubes, one can see melted tube walls and former lava stream levels. Kaumana tube also has examples of a small, late lava flow down the middle of the lava tube floor that left "gutters" along each side.